If you have a business and want to sell your products, services or software online then eCommerce software can help you to build your own web store and sell. With this software, you can build your online store or website very easily and quickly without any complexity of designing a new website. Also, you get many amazing features to design, manage and accept payment through your website. With a lot of options out there it’s very difficult to find the perfect eCommerce software that suits perfectly to your requirements. To ease your work here is a roundup of our top picks. 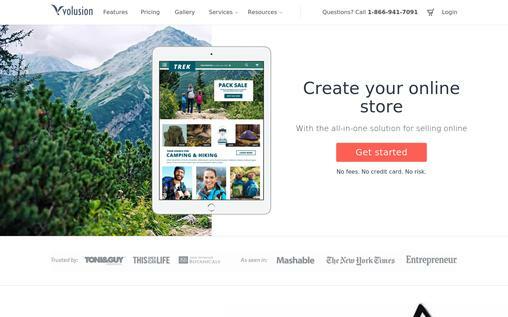 Shopify lets you create your own online store easily and quickly. It is loaded with tons of features and offers an affordable package for small business. 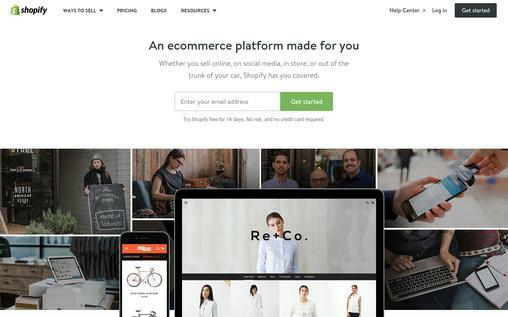 With Shopify, it is super easy to launch your website; you can set up your account in seconds with more than 100 ready to use themes to choose from. Once you sign up, you will be greeted with a simple and user-friendly dashboard, which makes it easy to get to a specific task. Plus, you don’t need to have any technical or coding knowledge to get started. Easy to launch your website in three simple steps. The online shopping cart of Shopify lets you accept payments through Credit Card and PayPal. It offers reports and analytics tools to measure the performance of your site. Shopify offers various marketing tools to promote your business like discount coupon code generator, social media integration, the ability to sell on social media, product reviews, google ads, email marketing etc. It has an uptime record of 99.99% so your store will be always live. The plan starts at $29 per month. And if you are just starting, then you can go for ‘Shopify Lite’ plan available at $9 per month. Shopify offers 24/7 dedicated customer support via phone, email and live chat. Though GoDaddy Online Store Builder is new in the eCommerce business but GoDaddy is a well-reputed and popular name for providing online services. With eCommerce builder offering many amazing services it has become a competitor to famous sites like Shopify. 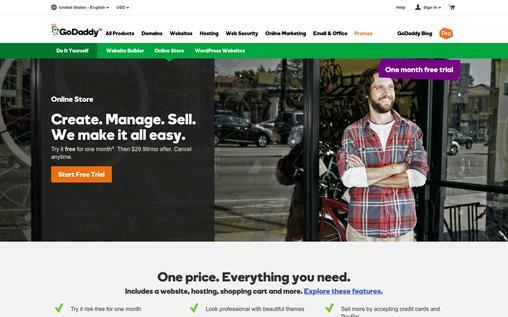 GoDaddy Online Store Builder is best suited for newcomers to eCommerce business looking to start out strong. It offers the longest trial period of one month. It is fairly easy to use for new users also. You can add unlimited products, generate coupon codes, and sync your website with Facebook store. It supports google analytics to track the progress of your website. With GoDaddy you can save the backup of your entire store. Professional looking templates to create a beautiful website. It offers basic SEO tools. Also, you get the option to submit your website to more than 100 search engines in a single click. Godaddy offers 24/7 phone support. 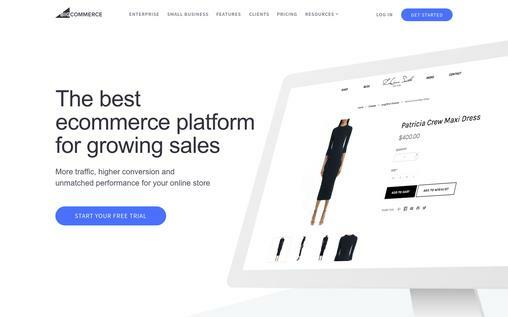 BigCommerce is one of the best eCommerce solutions for your business. It is well-known for its ease of use, professional looking templates, and quality customer support. It has an easy-to-use admin panel and it comes with many features that fit the needs of your business. With BigCommerce, it is very easy to add product and edit and create new orders. Also, you get a free 15-day trial to try it out, so you can test it without making any payment. Through Channel Manager, you can sell and manage sales at various channels like Facebook, eBay, Pinterest. You can import and export the product information in bulk in CSV format. Built-in blog feature to add blogs to your site to increase traffic and improve SEO. It has various SEO tools to increase your visibility. The checkout experience of BigCommerce is excellent on both desktop and mobile device. You can allow the customers to share the products and post their purchase on social media. Also, they can post reviews for the products. It offers single page checkout to your customers for a quick transaction. It has four main price plans: Standard, Plus, Pro and Enterprise. The plan starts at $29.95 per month. BigCommerce offers 24/7 customer support at all levels via phone, chat, and email. 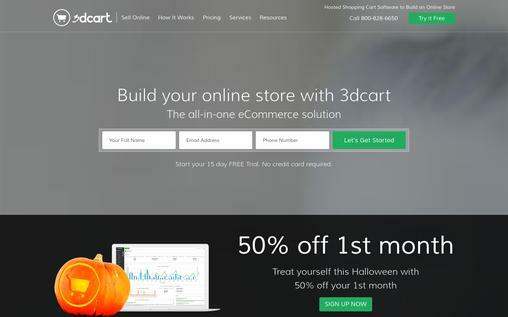 3dcart is an excellent choice if you are looking for an affordable, fully-hosted selling solution. It has many price options and loads of features. One of the unique features of 3dcart is that they offer nearly every feature at different price plans. That means the smallest business can get almost the same software as the largest. The base of its price plans is bandwidth usage and traffic of your site rather than functionality. You can sell both physical and digital products online. And the one-page checkout option speeds up the transaction. It’s a cloud-based software so you don’t have to worry about updating or managing your software. Lots of SEO tools to optimize your site. It integrates with more than 100 payment gateways, it also includes PayPal. You get 24/7/365 customer support via phone, email and live chat. 3dcart offers you more than 60 themes which are all mobile responsive. They have a wide range of pricing options starting from $9.99 per month. With 3dcart you get a no-risk trial of 15 days to try it risk-free. 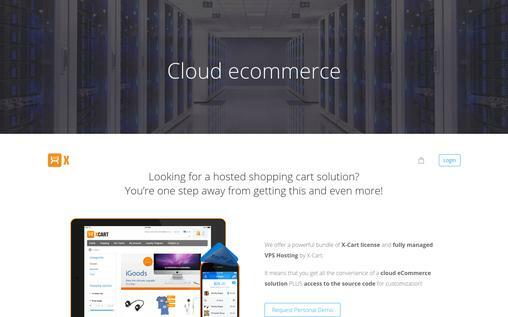 X-Cart provides all the major features that you need to build a complete website. It offers a robust set of web-design with shopping cart creation tools, though some of the features cost you extra. But if you want to add a good shopping cart to your website and money is not of much concern, then X-Cart is a solid choice. Get an unlimited number of personalized email addresses with X-Cart. The checkout system is smooth and easy for both desktop and mobile. Select from more than 75 payment gateways with X-Cart’s online shopping cart. There are no setup or transaction fees. It has a built-in blog and WordPress integration. It has an online knowledge base to search for your answers if you get any problem. X-Cart is the only company that meets the PCI compliance measures by offering TLS 1.2 encryption for additional security. Volusion is a popular shopping cart software that comes with many advanced features that one need to easily manage their online store and grow their business. It works wonderfully for both small and large size business. 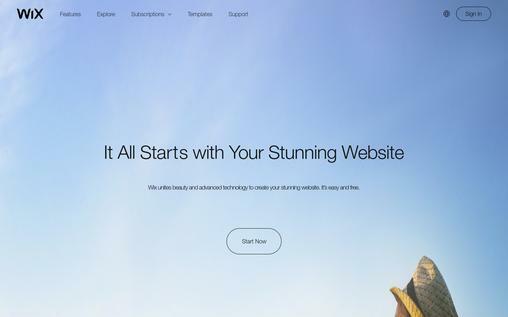 You can choose from 75 free themes to create a great looking website. Also, you get 24/7 customer and technical support via chat, phone, and email with all the plans. You can list unlimited product options. It can handle multiple currencies and also has automatic tax calculation feature. You can sell on Facebook, eBay, and Amazon and manage all the orders from the different platform from your Volusion store. Manage your store from mobiles, tablets or even smartwatches. Volusion has four pricing plans starts at $15/month. It integrates with more than 30 payment gateways, including PayPal Pro, Stripe, First Data, and Skrill. Offers a free trial of 14 days to all customers to try the platform at zero risks. Wix is completely cloud based software with hundreds of templates that fits perfectly in any niche. It allows you to easily design a custom website for your business. With a load of excellent features, many useful apps and integrations, you can create exactly what you want. It offers one of the best and reliable website building experience to its users. User-friendly and helpful video tutorials to help you get started. You can easily setup your store and start selling by accepting payments through various payment gateways such as PayPal, Skrill, WebMoney and many more. With Wix Blog manager you can quickly draft, edit and publish your blog posts. It is integrated with various social media platforms. The HTML5 editor tool of Wix is very simple, powerful and easy-to-use. You can create a free website with a free site’s URL with the free version of Wix. Wix offers many pricing plans starting as low as $4.08 per month. You can get support by calling at their toll-free number. 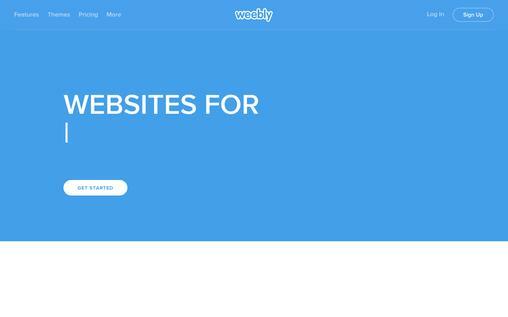 Weebly is one of the most popular and largest drag and drops website builder. With its flexible pricing options, tons of features, simple editor, user-friendly service and optimized mobile sites, you can get a complete eCommerce solution for your business. You can choose from three basic templates: Site, Store, or Blog. Each template group has 23 templates. You can add an unlimited number of pages and sub-pages to your blog and shop. Also, you can remove the entire page from your website. Through the Weebly store, you can accept payment in almost all of the World’s major currencies. You can add community forums to your website. Allow your users to stream videos directly from YouTube or Weebly’s own HD video player. You can manage your website from mobile devices. Weebly has an App center that offers 155 different apps to choose from. 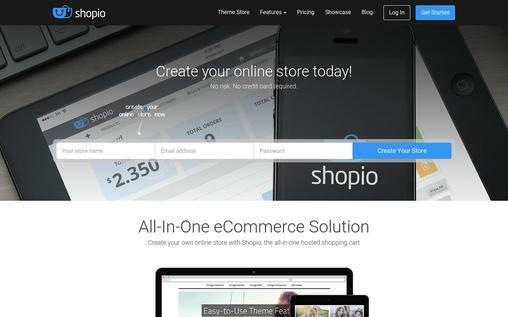 Shopio is an eCommerce website building software which helps SMBs (small to medium-sized businesses) to sell their products online at an affordable price. You can get started with Shopio without any technical knowledge or software installation. It offers a free plan where you have to pay nothing except the transaction fee for sell. Select from a wide range of completely customizable templates. All the templates are fully responsive and look great on mobiles, tablets, PCs. Every store at Shopio is protected by 128-bit SSL encryption. The paid plan starts from $29.95 per month. You can get support through live chat, phone, store, and email. You can also get in touch with the Shopio support team through social media accounts like Facebook, Twitter, Google+ and LinkedIn. 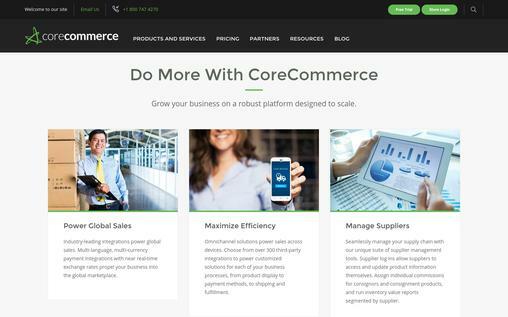 CoreCommerce is a fully web-based eCommerce software that helps you to build and maintain your online store. Other than creating and designing your store, you can also add and maintain products, orders, and customers. Since it’s web-based so you won’t have to bother about downloading or back up of your data. The clean and simple interface of the admin panel is very easy to use. Choose from hundreds of free templates and change them anytime. Offers social media, eBay and mobile device integration. It works with more than 50 payment gateways. It offers 24 hours email, phone and live chat on all weekdays and 8 a.m. to 5 p.m. CST on weekends. Offers a free trial of 15 days. eCommerce software is a great way to build a cost-effective website that is simple and easy to make. Also, it helps you to efficiently manage your product, orders, and payments. Hope the above list will help you choose the best eCommerce software for your business.